Art is such a personal thing. I happen to love anything architectural! So when I found these wonderful, chippy pieces of molding from old homes in Washington DC at a reuse it store I could not help coming home with a bag full. I had no idea at the time they would be hanging on my living room wall as art! Although the art is very neutral they make quite a striking, elegant statement! And the best part is this art was sooooo easy to make and very inexpensive! I’m so excited to show you how! Here are some pieces of molding I brought back from Washington DC. Aren’t they full of chippy character? I think so. Finding these fabulous architectural elements are easier than you think. Many town and cities have stores that sell reclaimed building goods. It’s so worth a trip if you have a store near you! You will be amazed at what you can find! Here’s how you can make your very own, one-of-a-kind architectural art! 2. Put a coat of Mod Podge on the front of the canvas. 3. 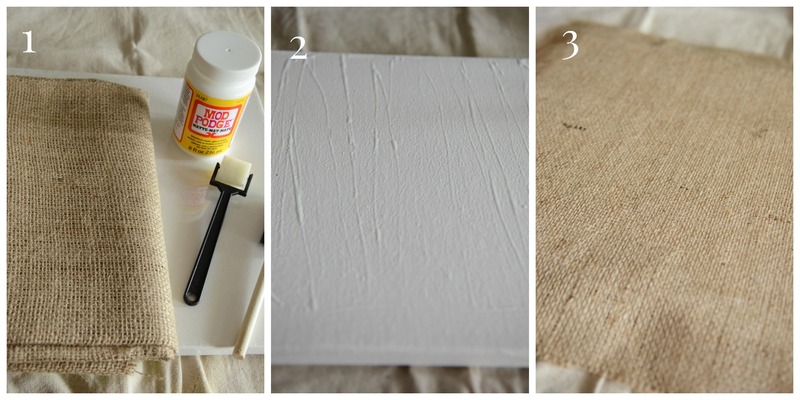 Center the burlap on the canvas and press down to adhere. 4. Starting on one side, stretch the burlap around the edge of the frame and staple it onto the frame. 5. Do the same to the OPPOSITE SIDE of the frame. Continue till all the burlap sides are stapled taut to the frame. 6. 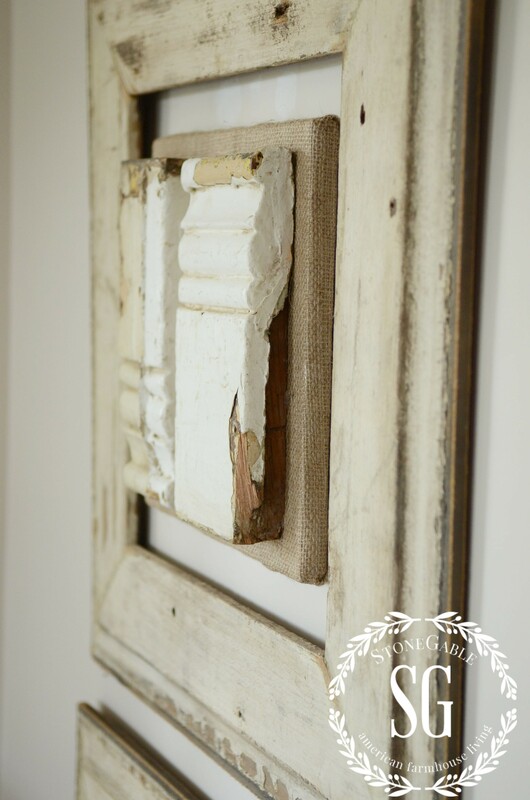 Turn the burlap canvas side up and place the architectural elements so they are pleasing to your eye. 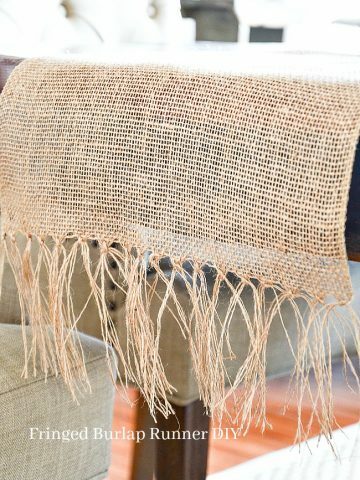 Use hot glue to adhere them to the burlap. 7. 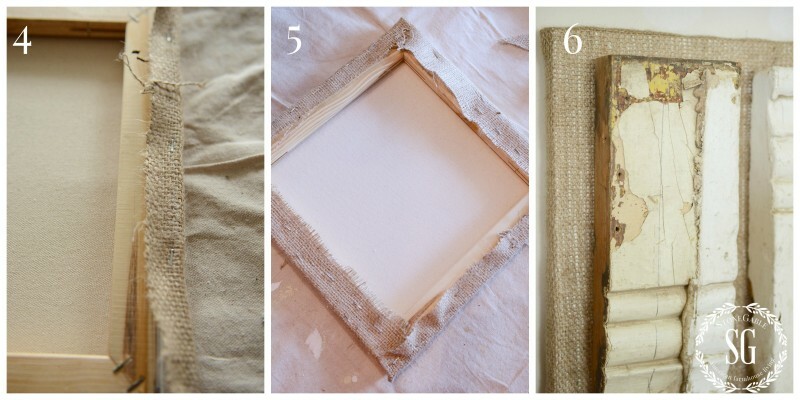 When the hot glue is dry, turn the the burlap face side down and staple the wood through the frame holding it securely. So easy and so fun! 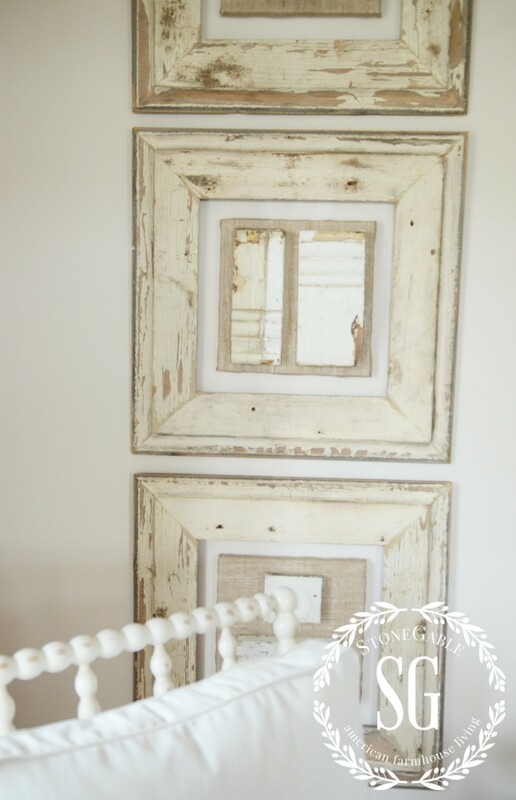 I hung my burlap canvases in larger chippy frames that I found at a local vintage craft fair to give them extra drama! I’m going to ask Bobby to figure out how to make these frames. 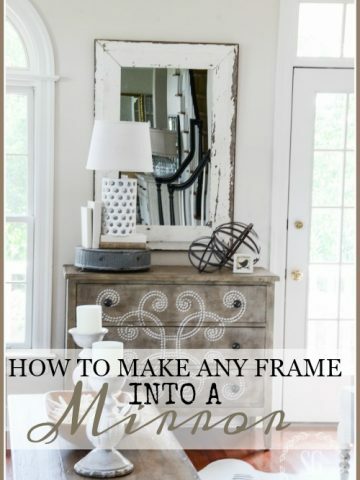 Hopefully, I’ll have a diy on HOW TO MAKE BIG CHIPPY FRAMES coming soon! And here’s how the Architectural Art looks in my living room! There are so many ways to make beautiful one-of-a-kind art out of scraps of this and that! I hope this has inspired you to try your hand at making your own original art! You might want to pin this to your Pinterst DIY or Craft board. You can also follow me and see all the diy’s I am pinning! Click HERE to follow! I love this idea, and now my mind is racing around thinking about all the possibilities! There’s an architectural salvage store in Lancaster, PA that I’ve been wanting to visit, so… I’m wondering about whether MMS’s milk paint would give this chippy look? What a neat project! 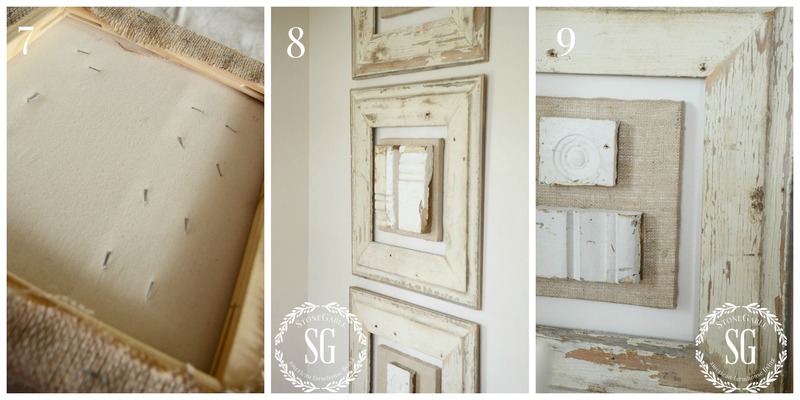 I am going to do this with some artistic salvage pieces! Thanks, also, for putting my anxieties to rest concerning lead paint. I understand that it will not harm anyone unless it is sanded or chewed on! Hanging on a wall and left alone, it is fine. 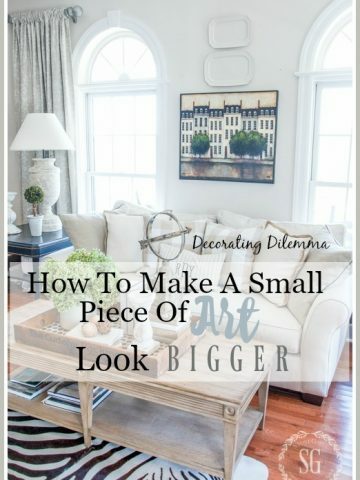 Love your wall art!! I am really into this type of art and projects. I got a old part of a wooden banister post ,thought would make a good candle holder,but not sure how stable it would be so I use it to hold a cowboy hat. Thank you, Yvonne for your sharing your life and home stories; this particular story is definitely one idea I will attempt. What talent and taste you have, just looking at this calm, beautiful room made me so inspired! Do you have formal training or are you intuitive to your surroundings? Your home, yard and recipe ideas are the best! Lovely! The art pieces look as if they were born to live there. Great l.r. too. Hi Mercedes.I got the frames while I was in Luckett’s Va for a fall craft show. Love this idea! On the look for some changes to my existing art . This might do the trick. Cherie Sikking said exactly what I was thinking! I do not know Cherie but she put it into words perfectly……..you are incredible! I enjoy your talent so much and it is always fun! What is your paint color in your living room? I love it! 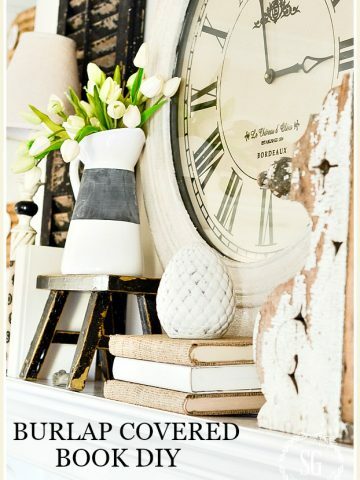 I am using black and cream in my family room and your art is the perfect final touch……..thank you so much! M.E. This a fabulous idea. I can’t wait for the hunt to find chippy wood. Hugs Sharon. Practically perfect in every way!! Where did you get the picture of buildings above the chest to the left of these chippy wall pieces? Who is the artist? Where can it be purchased? I absolutely live almost everything you do! Love what you have created Yvonne, they look so great in your living room! 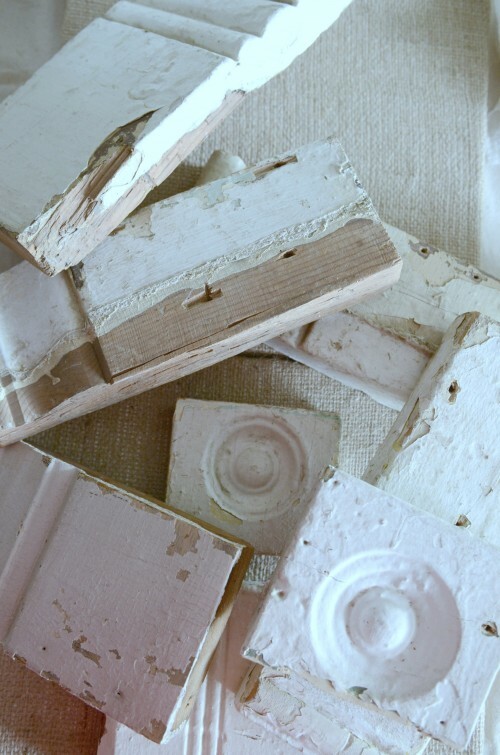 Concern: Do these old mouldings have lead paint? Particulation cold be a health issue. If lead paint is a concern, they can be sealed. Since they are up on the wall and will not come in contact with little ones, or will not chip anymore, I’m not worried about it. Still here with my tea each morning reading your visually delicious posts! Wow….you are so inspirational. Your photos and instructions are presented in a polished and professional manner which is perfect, but your “voice” is as if you were my sister sitting across our kitchen table. Whether I actively use your projects or not you are indeed a beautiful addition to my day. Thanks. Very pretty Yvonne…I love those chippy frames around them too! This is gorgeous. 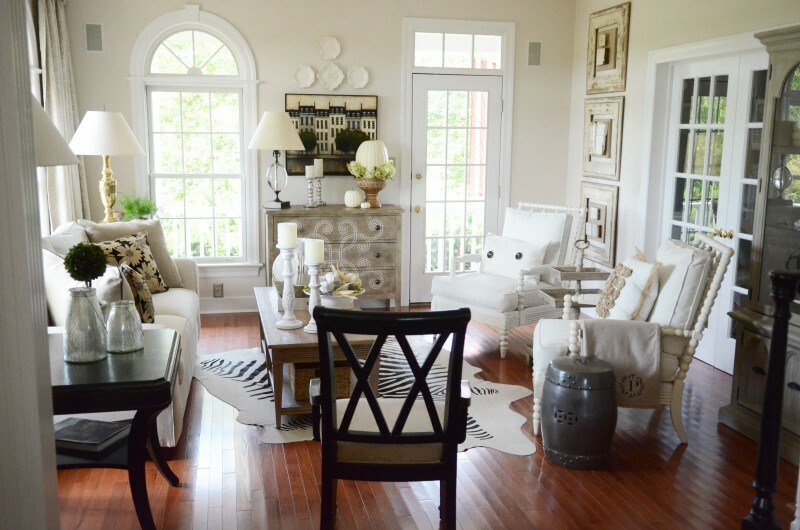 The fact that you kept the grouping monochromatic seems essential to the overall look. Otherwise it could be too busy (in my humble opinion 🙂 Very nice use of history. It looks just lovely Yvonne, what a great way to fill up a space and repurpose things. What a great idea! I can see endless possibilities with this and it’s just the nudge I needed to get crackin’ on some new projects! Thanks!!! NOW, that was exceedingly cool….THANKS Yvonne for the inspiration!!!! !